We recently took part in the NTET #Builtinnorthampton event on Facebook, for those without an account below is a recap of the information shared. Today we focus on Allchin who built engines at the Globe works in Northampton. 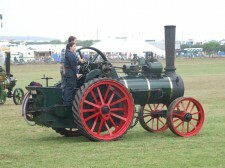 We start with Allchin No.1470 which was new in 1909 to F Phoenix & Sons of Norfolk. Sadly we have very little information about the engine. Allchin No.3858Now we have Allchin No.3858 which was built in 1931 and known as ‘Knapp’. The engine seen here was in the ownership of richard hilton and likely at Stan Burgess’ yard in Haddenham. Later in the engines life it was converted from its roller form to a Tractor/Road loco. Allchin No.1527An engine that has spent her whole life in our region is Allchin “Feicity”, No. 1527. She attended earlier rallies such as the Sudbury Olde Tyme Rallye with the Stubley family of Monks Eleigh, who we believe were her commercial owners. After many years with the late Bily Bird of Tunstead she is now with Peter Williams of Wymondham and still regularly seen working on the belt. Allchin No.669“Bess”, No.669, is the oldest surviving Allchin engine, owned by Stephen Hubbock. She was owned by Charlie Russell in Sussex and sold with his other engines at Chilford Hall near Cambridge. She travels to most events under her own steam,quite an achievement for such a venerable old lady.